Here's me playing with China Glaze Fault Line and Broken Hearted. I don't remember everything it's layered over, but it included Milani Magenta Metal as the base and Sally Hansen HD in Byte on top of everything. I liked the subtle crackle effect of Fault Line with little glints of duochrome sparkle from Byte peeking through. Fault Line still doesn't crack as well as the other shades, but I did get it to crackle more this time by applying it over completely dry polish and waiting 5 minutes before applying topcoat. This one I actually liked. It's China Glaze Lightning Bolt over the random pink polish mess. I love the way the glass fleck sparkles in Byte shine through the cracks of the white polish. White crackle is really neat. I want to do it over neon yellow... think I'll try that soon. I love both of these combinations! Lighting Bolt over the Pink. I've worn my crackles so much even I'm getting sick of them looool. i really love the white combo. kicking myself a little because i didn't think i needed it. I really can not wait until my crackles arrive! The white one is gorgeous! Love the combinations. I have to check if their in stock again. I tried 5 places online and they were all sold out. 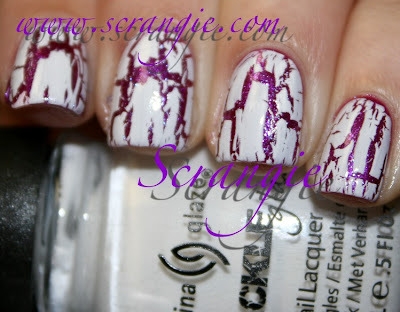 The white crackle is soooo gorgeous! Can't wait for my own to come in next week!